We are knee-deep in a winter wonderland right now, and spring is still a few months away! Here at the Natural Sleep Store we are loving all things healthy, cozy and warm, which means Organic Flannel Sheets! We are happy to offer Naturesoft Organic Flannel Sheets as our first giveaway for the New Year!! No purchase necessary to win, contest ends February 28th, 2017. You choose the sheet set size. Valued up to $147.00. Naturesoft Organic Flannel Sheets are a super-soft, brushed organic cotton. 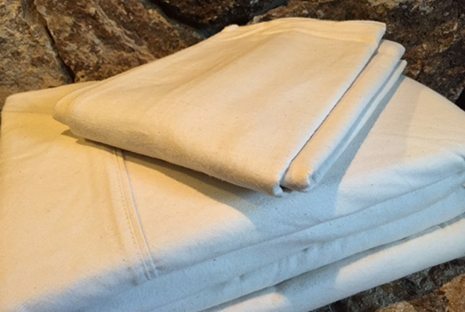 Organic Flannel Sheets are a bedding essential when the weather changes and the cold winters set in. Changing sheets in fall and winter from organic cotton percale or sateen to organic cotton flannel is an affordable, simple way to a little extra warmth to those cold nights. Naturesoft Organic Flannel Sheets are made from undyed unbleached GOTS certified organic cotton. These sheets are a customer favorite because they are a great value and made in the USA from start to finish. The 16” pocket depth make them a good fit for most mattresses. We want you to stay warm and cozy this season and making Naturesoft Organic Flannel Sheets the foundation of your winter bedding is the perfect start! No purchase necessary to win, contest ends February 28th, 2017. You choose the sheet set size. Valued up to $147.00. Contest ends February 28th, 2017. Congrats to Daniel G, from Arcadia, CA who won this giveaway!